In Eclipse, select Help > Eclipse Marketplace. Locate Apache Directory Studio and select Install. When prompted, select Restart Now. Select Window > Perspective > Open Perspective > Other. Near the bottom left hand corner of Eclipse, select New Connection. Complete the form, and then select Check Network Parameters. 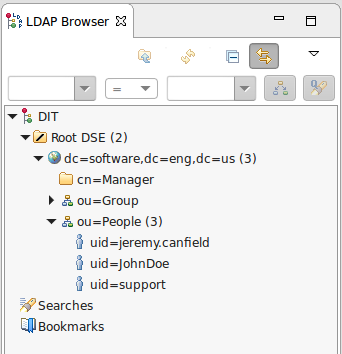 If you are able to connect to the LDAP host, "The connection was established successfully" should be displayed. Enter a fully qualified user, such as uid=JohnDoe,ou=People,dc=example,dc=com, and click Check Authentication.